What foods are most likely to become contaminated with salmonella? How do I know if a food has been contaminated with salmonella, and where can I find a list of recalled products? What pets can carry salmonella? Who investigates a salmonella outbreak? What are the symptoms of salmonella poisoning? Can you die from salmonella? Can you get salmonella from drinking water? Can you get salmonella from another person? Salmonella is one of the most common causes of food poisoning in the United States. Each year, salmonella infections, called salmonellosis, sicken more than 1 million people. Up to 450 die from salmonella poisoning annually. The common bacteria “can live in many animals, such as livestock, pets, reptiles, and sometimes humans,” says Alan Taege, MD, an infectious diseases specialist at the Cleveland Clinic. Salmonella can be found in the intestines of animals, especially pigs and poultry, and it is spread through their feces. For example, if contaminated feces get into the water that’s used to irrigate crops, those crops can carry the bacteria to the market. Raw poultry can sometimes be contaminated with the bacteria. It can be spread throughout your kitchen if you don’t wash your hands, cutting board, and any knives or other utensils after you handle raw poultry. Any raw or undercooked animal product can carry salmonella. That includes meat, unpasteurized dairy products like milk and cheese, eggs, and seafood. Fruits, vegetables, and nuts also can become contaminated with salmonella. In recent years, the CDC has reported outbreaks associated with particular brands of alfalfa sprouts, pistachios, nut butters, and cucumbers. You can’t spot salmonella by looking at or smelling food. However, you can keep up to date on reported outbreaks if you are concerned that your food may be contaminated. The CDC and the FDA have information about ongoing and recent outbreaks, including which products consumers should avoid. Turtles, frogs, lizards, and other reptiles and amphibians often carry salmonella. Because they spread the bacteria through their feces, you can become infected by handling them or cleaning up after them. The same goes for backyard chickens, another common carrier of salmonella. Such pets will not show signs that they have the bacteria, so it’s best to be cautious and act as if they do. Always thoroughly wash your hands after coming into contact with or cleaning up after any potential carriers. Don’t allow them into your kitchen or any rooms where food is stored, prepared, or served. Salmonella can sicken pets such as cats and dogs, so avoid feeding them raw foods. Local government health agencies investigate outbreaks in their areas, such as those traced to a particular restaurant. At the federal level, the CDC and the FDA investigate salmonella outbreaks. The CDC monitors reports of foodborne illness in order to identify outbreaks. Once an outbreak has been declared, the agency traces where it started and alerts the public. The FDA also keeps tabs on signals that might indicate an outbreak. When one occurs, they coordinate recalls of tainted products in order to stop it. When the outbreak ends, the FDA examines its causes and works on ways to prevent future outbreaks. “Some people may merely carry the organism in the digestive tract and not be ill, but typically it will cause nausea, vomiting, and diarrhea -- sometimes with fever,” says Taege. Other symptoms may include headache, abdominal cramps, and loss of appetite. These symptoms usually start within 12 to 72 hours after infection. They last for 4 to 7 days. However, it can take several months for bowel habits to return to normal. In rare cases, salmonella also can cause reactive arthritis, a type of joint pain that can last months or years and eventually may result in chronic arthritis. Usually, salmonella poisoning goes away on its own, without treatment. Drink plenty of fluids in order to stay hydrated if you have diarrhea. Still, Taege recommends that you call your doctor to talk about your symptoms if you suspect you ate contaminated food. “The bacteria may occasionally enter the bloodstream and cause a more serious infection, he says. You should also consult a doctor if you are over 65 or have a weakened immune system due to illness, because you may be at risk of more severe symptoms. Children under the age of 5 are also at risk of severe infection. Such cases, as well as those with severe complications, often require antibiotics and, possibly, hospitalization. 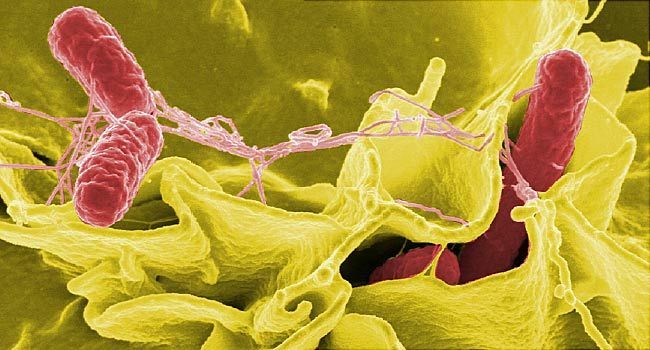 Salmonella is rarely fatal, but if the bacteria enters your bloodstream, it can be life-threatening, especially for people with weakened immune systems, such as the elderly, the very young, and those with diseases like cancer and HIV/AIDS. You can protect yourself against salmonella poisoning in several ways. Thoroughly cook poultry, ground beef, and eggs. This kills the bacteria. Avoid foods that contain raw eggs or unpasteurized milk. Wash your hands, cutting boards and other work surfaces, and knives and other utensils with soap and water right after prepping raw meat or poultry. Don’t let raw meat or poultry come into contact with other foods, especially those that don’t require cooking (for example, lettuce, tomatoes, and other raw salad ingredients. Because salmonella bacteria grow and multiply at room temperature, foods should not be left out of the fridge for more than 2 hours. Lost track of time? “If you believe food has been left out too long, it is best to discard and avoid eating it,” Taege advises. Yes, you can get salmonella poisoning if you drink contaminated water. For example, it can get into private wells in infected feces from sewage overflows or faulty sewage systems. Polluted storm water and agricultural runoff can also contaminate drinking water. In 2008, for example, water contaminated with salmonella sickened nearly 450 people in Alamosa, CO. One person died. Salmonella poisoning can be passed from person to person. If you are infected with salmonella and don’t wash your hands thoroughly after a bowel movement, your dirty hands can pass salmonella along in several ways, including: direct contact with another person, touching a surface that someone else then touches, and preparing food that is served raw or undercooked. Alan Taege, MD, infectious diseases specialist, Cleveland Clinic. Elizabeth Scott, PhD, associate professor of biology, co-director of the Center for Hygiene and Health, Simmons College.